Multiple sclerosis (MS) is an incurable disease. However, proper MS treatment is the best possible alternative, and can help to manage symptoms and modify the development of the disease. 1.0.2 Slowing of disease progression. Treatment for MS often focuses on recovery from attacks and slowing of disease progression, both of which are used to manage the symptoms and improve function and quality of life. Symptoms of MS often come and go. When one experiences an attack, symptoms are typically at their worst. Treatments are used during these periods to decrease symptoms as much as possible. To reduce nerve inflammation, doctors may prescribe corticosteroids, such as intravenous methylprednisolon or oral prednisone. Side effects of these prescriptions may include increased blood pressure, mood swings, insomnia, and fluid retention. Plasmapheresis is a process where the liquid portion of the blood, called plasma, is separated and removed from the blood cells. The plasma is mixed with albumin (a protein solution) before going back inside the body. This plasma exchange is often used for cases that are new, severe, or those that don’t respond to steroids. There are several therapies for modifying the progression of MS in relapsing-remitting MS patients. Much of the response associated with this disease occurs in the beginning of the disease progression. Providing the patient with aggressive treatment as early as possible can slow the formation of lesions and lower the rate of relapse. Beta interferons are the most commonly prescribed medication for MS. These medications are injected under the skin or into the muscle. Beta interferons are known to reduce the severity and frequency of relapse. Side effects include injection-site reaction or flu-like symptoms. Glatiramer acetate is a medication that helps to block attacks on the nerves. It is injected beneath the skin. The main side effect is skin irritation at injection site. Dimethyl fumarate is orally taken twice a day to reduce the number of relapses. Side effects include diarrhea, nausea, flushing of skin, and drop in white blood cell count. Fingolimod is also taken orally. It is taken once a day to reduce the rate of relapse. One possible side effect is a drop in heart rate. Therefore, the heart must be monitored for at least six hours when taking the first dose. Other side effects include high blood pressure, blurred vision, or headache. Natalizumab aims to block immune cells that can damage tissue in the brain and spinal cord. This is considered to be the first line of treatment for people suffering from severe MS. However, this medication increases the risk of a viral infection of the brain, called progressive multifocal leukoncephalopathy. Terifluonomide is taken once a day to reduce the rate of relapse. It can cause liver damage and hair loss, aside from other side effects. Additionally, it is not recommended for women who are pregnant. Alemtuzumab also helps to reduce relapses by targeting a surface protein of immune cells and depleting white blood cells. Side effects include development of autoimmune disorder and infection. This treatment includes infusions of the medication for five consecutive days, and three days of infusions after one year. Reactions to the infusions are quite common and this drug is available from registered providers only. People treated with alemtuzumab must be registered in a program specifically designed for monitoring the patients. Mitoxantrone is an immunosuppressant drug that can result in damage to the heart. It is also associated with certain types of blood cancer. For these reasons, this drug is rarely used and is reserved for highly advanced, severe cases of MS. There are a variety of alternative treatments that can help MS patients manage their symptoms. These include activities such as meditation, yoga, regular exercise, massage, healthy nutrition, acupuncture, and relaxation techniques. The purpose of these treatments is to boost mental and physical well-being. Additional treatments for MS include physical therapy, muscle relaxants, anti-fatigue medications, and others. 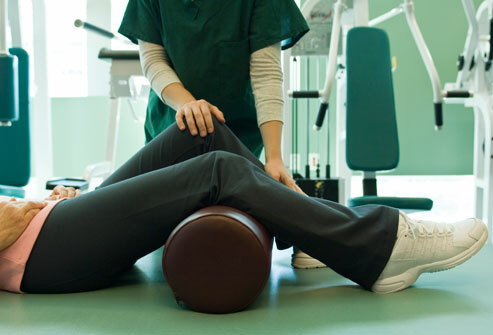 A physical therapist often helps with strengthening and stretching exercises. They may also help a patient learn how to use devices to increase function and mobility. Other medications that may be prescribed for sexual dysfunction, bladder control problems, depression, pain management, and other problems associated with MS. The course of MS is most often a relapsing-remitting one. In these cases, the patient experiences relapsing periods where symptoms develop over days or weeks. These symptoms can improve either partially or completely, and the relapses are followed by remission periods that can last for months. In some cases, the quiet periods may last up to a year. About 60% to 70% of those with MS have relapsing-remitting MS, and the symptoms typically progress steadily over time. Symptoms of MS may worsen as a result of small body temperature increases, but this is not considered a relapse. Mobility and gait often are often affected when the disease progresses. Other types include primary-progressive MS and secondary-progressive MS. Primary-progressive MS has as a gradual onset and progression of symptoms without relapses. The rate of the progression varies among patients with secondary-progressive MS. The treatment for MS is determined upon a correct and accurate diagnosis. MS is an autoimmune disease where the immune system attacks the nervous system. Specifically, the immune system attacks and destroys the myelin, a fatty substance that protects the nerves located in the spinal cord and brain. When this happens, the messages that travel along nerves are either slowed or blocked. This can also result in complete nerve damage. The reason why some people develop MS and other don’t is currently unknown, but the most probable cause are thought to be environmental or genetics-based. Furthermore, there is currently no cure for MS. There are many factors that may increase the risk of developing this disease. Women are about twice as likely as men to develop MS.
MS most commonly affects people between the ages of 15 and 60. However, this condition can occur at any point in life. If a parent or sibling was diagnosed with MS, the risk for developing MS increases. People of Northern European descent are at a higher risk of developing MS. There are certain infections and viruses commonly linked to MS. These include Epstein-Barr, a virus that can cause mononucleosis. Certain locations, such as Canada, New Zealand, Europe and Southeastern Australia, have a higher prevalence of MS.
Autoimmune diseases, thyroid disease, inflammatory bowel disease, or type 1 diabetes are associated with a slightly higher risk of developing MS. Smoking can also increase the risk of MS.